If you love getting fit at Axis and would like to save some money, check out the great class packages and memberships available. Want to find out when your favorite classes are offered? Want to check try out a new class? View the Axis schedule. Book a class and drop in when your schedule is open. If you want to try a pole, lyra, or silks class, go for it! Want to drop in for a flexibility class? Sounds great! Not sure where to start? Call us (713) 408-4723. If your schedule isn't very consistent, but you want a discount on classes, the Discounted Class Package might be ideal. Includes 10 classes that can be redeemed at any time within one year. Monthly Memberships include any two classes a week. Focus on one piece of equipment or add some variety. Monthly memberships are great if you want to incorporate steady progress into your routine. Versus the drop in rate, that's a savings of $85 a month. Consistency pays off! 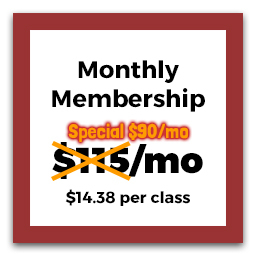 Premium Monthly Memberships include any three classes per week plus all open gym hours. These dedicated members can see about $340 in savings per month based on weekly classes and two open gym sessions a week versus the drop in rate. Fitness looks good on you. Six Month Memberships get all of the same perks as Premium Monthly Memberships - access to three classes per week plus all open gym hours and gym facilities. No refunds on this membership. If you are consistently using your Premium Monthly Membership, this would save you about $240 every six months!